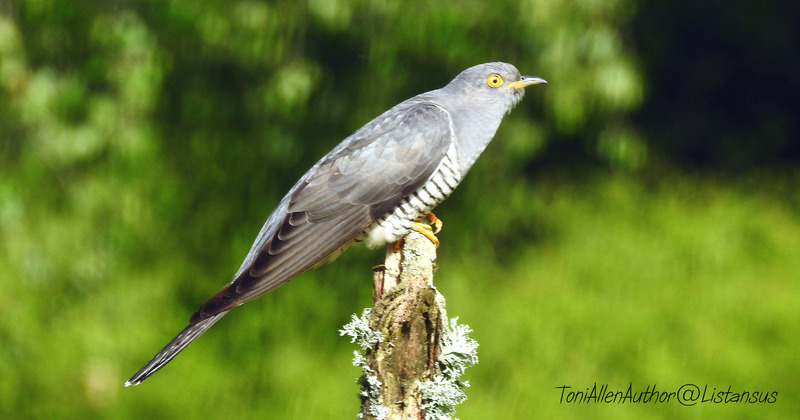 I started writing this blog post about Charlie the cuckoo as part of the #30DaysWild challenge but a health hiccup set me back. Some things had to go and it’s been my blog that suffered while I concentrated on the things I love most, writing and taking photos. This does, however, mean that I have lots of great photos to share and a nearly completed novel. There’s nothing quite like a health scare to make you live life to the full. 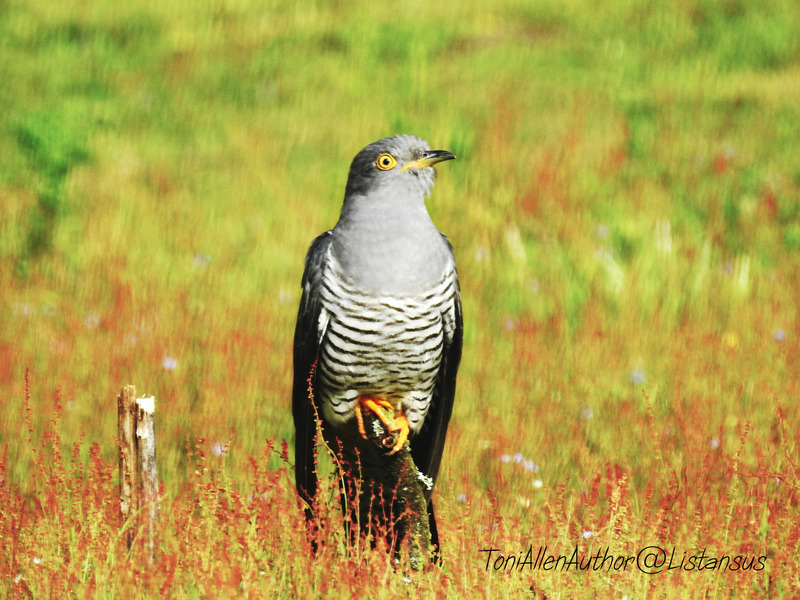 To me cuckoos have always been an elusive bird, something that is often heard but never seen. Many a time I’ve caught their distinctive call, looked towards distant trees but seen nothing. Friends and fellow photographers have entertained me with stories of how they saw a cuckoo whilst out cycling or snapped a few choice shots over the weekend. To me the cuckoo was invisible. But that was all about to change. Earlier this year my friend and I were out taking photos, the cuckoo called and a passing local asked if we’d been over to photograph it yet. Over where? Where everyone else was going, of course. Apparently twitchers from right across the country were descending on a modest meadow not far from where we were standing and creating a dreadful nuisance in their pursuit of a regular summer visitor named Charlie. We were informed that Charlie the cuckoo is not tame but easily baited with live mealworms and therefore a photographers dream. A few days later my friend did a reconnaissance ride-by on his bicycle and reported back that the meadow was full of photographers with lenses the size of cannons and not a cuckoo in sight. ‘Mayhem,’ he said and we made plans to visit the meadow on a quieter day of the week when the visiting twitchers were unlikely to be there. Seeing my first cuckoo – at last! Armed with my Nikon super-zoom, a monopod and a spare battery, we set off to find Charlie. As luck would have it, only one lone photographer was in the meadow, his lens aimed at a post stuck in the ground and his bait wriggling in a small pot by his side. 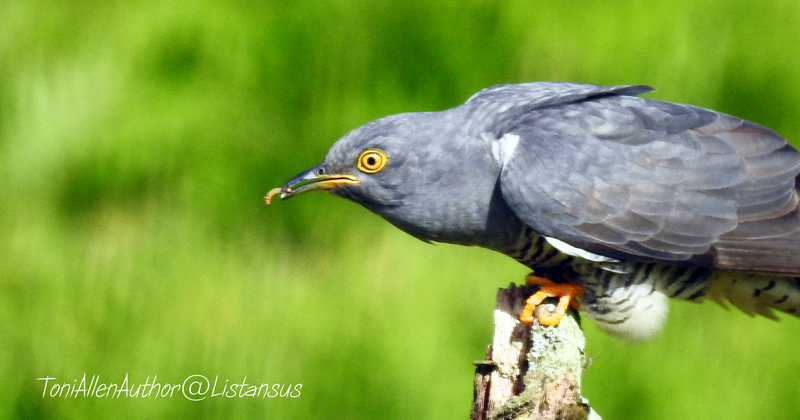 From a distance I caught my first glimpse of the cuckoo, feeding on the ground. Quietly we approached and thankfully the photographer was quite tame too and happy for us to sit and share his pitch. In the dazzling afternoon sunshine Charlie was truly magnificent. His wings were the colour of a steely grey sky, shimmering and glistening against his stripy t-shirt. And those eyes! Bright yellow, like sugar coated sweeties. Only sweets don’t watch you and Charlie was very aware of our presence. We were sat on an invisible line and I wondered if Charlie himself had drawn it on the ground because one step closer and he instantly flew away. We were at least 30/40 yards from Charlie so I was glad I’d taken my super zoom. Even though the picture quality isn’t as crisp as my Olympus I managed to capture some pretty decent shots. The cuckoo is now on the RSPB’s red list of endangered species so never forget to stop and listen to their distinctive call. Who knows, in a few years’ time our woodlands may no longer resound with ‘cuckoo’ during warm summer days.